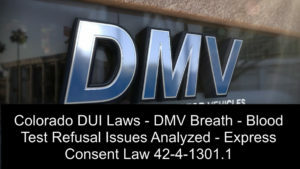 Colorado DUI Laws – DMV Breath – Blood Test Refusal Issues Analyzed – Express Consent Law 42-4-1301.1 – One of the most devastating impacts of A Colorado DUI case is the loss of your driver’s license. The Colorado requirement to take “the test” is called the express consent law. This article analyzes a refusal to take the blood or breath test in this state using a Q and A format. Colorado’s Express Consent Law § 42-4-1301.1 (follow this LINK to read the entire law). This law. the Colorado Express Consent Law, used to be called the Colorado Implied Consent Law and you may see a version of the law on the internet described with that name. 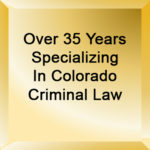 In either case the law governs a very significant stage in a Colorado DUI case. A simple rule – under Colorado’s Express Consent Statute, when a police officer with probable cause requests and directs a driver to take a blood or breath test, the driver is required to take, complete, and cooperate in the completion of the test. Section 42-4-1301.1(2)(a)(I), C.R.S. If the driver “fails to take and complete, and to cooperate in the completing of, the test elected, the failure shall be deemed to be a refusal to submit to testing.” Section 42-4-1301.1(2)(a)(II). If you are cited for refusing to take the test and you have requested a hearing (see below) the hearing officer’s finding on the refusal issue must be based on an application of the proper objective legal standards and a fair resolution of sometimes conflicting inferences from the evidence presented at your hearing. While most police officers will politely explain to you there is no right to consult a lawyer before deciding to take, or not take the test – or to decide which test to take, – they do not have to do so – the request to speak to an attorney before taking a chemical test is deemed a refusal as a matter of law. Typically the police will use a form that contains the advisement in writing, but they may also advise you orally from a card or from memory. Once again, because this is a difficult pill to swallow, non-cooperative conduct in taking a test such as demanding the right to first speak to a lawyer is tantamount to a refusal. A person has no right to speak to an attorney before taking a chemical test. Insisting on the right to speak to an attorney constitutes a refusal. All refusal hearings are conducted by Department of Revenue hearing officers. These officers are not connected with the Motor Vehicle Division. The hearing officers make the decisions about whether revocations are imposed, the length and terms of suspensions, and whether the State of Colorado has or has not met it’s burden of proof is made by administrative law judges who are not – in my opinion – in the pocket of anyone. The distinction between what happens in Court (the criminal side of DUI’s) and what happens at the DMV (the civil-administrative side of DUI cases) is critical to understand as they are often conflated. Driver’s license sanctions, such as refusal revocations that can be imposed by DMV act independently of the criminal of the case which occurs in court. Both sides of the DUI case must be understood to fully comprehend the full impact of a DUI charge in Colorado. A Colorado driver is required to submit to a chemical test if a police officer has probable cause to believe that driver is operating a vehicle while his or her ability to operate the vehicle is affected by the use of alcohol or drugs. (C.R.S. § 42-4-1301.1(2)(a)(I)). Probable cause can apply to the belief that a driver is even just slightly impaired by alcohol, drugs, or a combination of both. If the facts sustain this belief by a preponderance of the evidence, the driver must submit to a test or tests of his or her blood, breath, saliva, or urine. C.R.S. §§42-4-1301.1(2)(a)(I) and (b)(I). 3) A refusal by the driver to take, complete, or cooperate in the completion of properly administered tests of his or her blood, breath, saliva, or urine such that the samples could be obtained within two hours of the time of driving, (C.R.S. §§ 42-2-126(2)(h) and 42-4-1301.1(2)(a)(III) and (2)(a.5)(III)). 1. A police officer with probable cause to arrest based on suspicion of DUI – DWAI – or DUID (drugs) makes that arrest. The driver, after being advised of the Colorado Express Consent Law, (LINK) refuses to take either a blood or a breath test. 2. The law then requires the arresting officer (under C.R.S. § 42-2-126(5)(b)(II)) to act as the agent of the DMV and to take immediate possession of the person’s license and that is true whether that license is issued by Colorado or another state. 3. The officer then serves the driver with an Affidavit and Notice of Revocation stating the probable cause to believe that the license should be revoked. (C.R.S. §§ 42-2-126(5)(a) and (b)(I)). 4. A copy of the affidavit, along with any supporting reports in existence at the time to include the affidavit for warrantless arrest, the results of roadside sobriety tests (if any), and all other documents are then sent to the DMV. (C.R.S. § 42-2-126(5)(b)(III)). 5. If the in or out of state driver’ license confiscated by the officer is a valid driver’s license, the officer will issue a temporary permit allowing the person to drive for seven days. (C.R.S. § 42-2-126(5)(b)(II)). This permit is attached to a document called the Affidavit and Notice of Revocation. 6. The driver must contact the DMV in person or in writing to request a hearing concerning the revocation WITHIN THE 7 DAYS. If the refusal hearing is not requested within those 7 days, the revocation automatically takes effect on the eighth day. (C.R.S. § 42-2-126 (7)(b)). Colorado “Refusal” DMV Revocation Cases – What Exactly IS A Refusal? “Refusals” can take many forms in a Colorado DUI blood alcohol “test” refusal context. There is the obvious outright spoken refusal to take the test. Then there is the failure to cooperate with the taking of the test refusal such as refusing to sign the proper forms. Another type of failure to cooperate refusal is intentionally not “blowing” hard enough into the intoxilyzer machine. Yet another is the no decision refusal, the repeatedly changing one’s mind between a blood and breath test and the silence in response to the question refusal…. etc. etc. All of these “forms of refusal” turn on a specific failure to cooperate in one form of another. Essentially the Express Consent Statute requires that the driver cooperate with the officer while the officer remains engaged in requesting or directing the completion of the test. What if you “recant” (reverse) the decision to NOT take the test. A recent Colorado case – the Gallion case – answers this question. Although Colorado law permits a “recantation” – in this case – the Court found that the arresting officer had already returned to duty, and somewhere between 75 and 80 minutes had passed since the driver was driving. The Court held that her recantation was not timely as Gallion did not recant her refusal until after the arresting officer left the detention facility and resumed his duties. To be valid, a recantation must be made to the arresting officer or law enforcement officer with probable cause to believe the driver was violating the law, and must also be made within sufficient time to obtain a blood or breath sample within two hours of the person’s driving. Gallion v. Colorado Department of Revenue, 171 P.3d 217 (Colo. 2007). The Supreme Court in Gallion made clear that a request to take a test following an initial refusal must take place at a time when the police remain “engaged in the process of requesting and directing the completion of a test.” Thus, in a situation where the officer had left the police station and returned to patrol, a request to be tested at that time was deemed invalid. In a “timely recantation” – what type of testing should occur after a recantation? The driver in Bradt, chose a blood test, but then refused to cooperate with the blood test procedure. About 20 minutes later, after the phlebotomist left, the Bradt told the arresting officer that she would take “a” test because she did not want her license to be revoked. The officer told her he would not call the phlebotomist back, but that he would allow her to take a breath test and would not hold her previous refusal against her. The results were over the time limit, and the DMV revoked her license, holding that she had given up the right to a blood test by initially refusing the test. An individual may change his mind after an initial refusal and decide to take a test, but the arresting officer must still be present and the burden is then on the individual to show that the test result would not have been materially affected by the delay. TIMELY cooperation is the key. If the police officer has requested the test and has reasonably determined that the driver is refusing testing and if that officer has completed his duties prescribed by statute to deal with a refusal, and left the presence of the driver, the critical time period during which the driver must show TIMELY cooperation has probably come to an end. Cases in this area are very fact specific….whether a driver “cooperated” in the taking of the test and in the recantation of the refusal to take the test – will always turn on the driver’s statements and behavior indicating a willingness or unwillingness to take the test and precisely when those statements occurred. The Colorado General Assembly has removed any discretion an arresting officer has concerning an arrested driver’s desire to change the type of chemical test he or she wishes to take. Once a person has made a decision regarding which test to take, the arresting officer is not authorized to allow the person to change his or her mind and take a different test. (II) Except as otherwise provided in paragraph (a.5) (extraordinary circumstances – see below) of this subsection (2), if a person elects either a blood test or a breath test, the person shall not be permitted to change the election, and, if the person fails to take and complete, and to cooperate in the completing of, the test elected, the failure shall be deemed to be a refusal to submit to testing. If the person is unable to take, or to complete, or to cooperate in the completing of a breath test because of injuries, illness, disease, physical infirmity, or physical incapacity, or if the person is receiving medical treatment at a location at which a breath testing instrument certified by the department of public health and environment is not available, the test shall be of the person’s blood. The two types of chemical sobriety tests offered to drivers on Colorado’s highways are a function of statute. You must select one type of test from the two alternatives. In the nature of things- the right to take a test (to show you are NOT intoxicated or otherwise impaired) – when you WANT ONE – must be honored as well unless there is good cause for the unavailability of the choice made by the driver, or the driver is medically unable to make a selection. The general rule is a law enforcement officer must honor the choice made by the driver. If the police officer unreasonably fails to honor the driver’s choice, the remedy is dismissal. Blood alcohol testing can establish innocence as well as guilt. The law that can be used as a sword can also operate as a shield. Only under extraordinary circumstances can the sanction of dismissal for refusing to honor the driver’s choice of test be avoided. What then are extraordinary circumstances? “Extraordinary circumstances” are clearly defined in the following three sections at C.R.S. § 42-4-1301.1(2)(a.5)(IV). (A) As used in this paragraph (a.5), “extraordinary circumstances” means circumstances beyond the control of, and not created by, the law enforcement officer who requests and directs a person to take a blood or breath test in accordance with this subsection (2) or the law enforcement authority with whom the officer is employed. The burden of proving extraordinary circumstances for noncompliance with the requirements of the express consent lies with the prosecution. What If Blood Test Personnel Do Not Show Up To Take My Blood – Can That Be Held Against Me? The case that answers the above question is People v. Null, 233 P.3d 670 (Colo. 2010). Null stands for the rule that the mere showing that medical personnel failed to respond to conduct the blood draw is NOT sufficient when there was no showing that that failure to respond was not caused by extraordinary or non-routine circumstances. Putt differently, just showing that medical personnel were not available to perform a blood draw without showing the extraordinary circumstances that prevented a timely response existed is ….is insufficient at law. The State must show the failure was caused by extraordinary circumstances. What If I Am Taken To A Hospital For Medical Reasons And I Want A Breath – Not A Blood – Test? C.R.S. Section 42-4-1301.1(2)(a)(II), provides that a breath test need not be offered if the driver is medically unable such as in an accident to take a breath test or if the person is receiving medical treatment at a location where a breath-testing instrument is not available. If the “two-hour time limit” would expire before a Defendant can be taken to a facility that had breath testing equipment, in such a circumstance, a police officer is not required, pursuant to C.R.S. § 42-4-1301.1(2)(a)(II) to offer or comply with a request for a breath test. What If It “Appears” As If You Are Refusing To Provide A Sufficient Breath Sample? There are times when the person blowing into the intoxilyzer cannot or will not provide a sufficient sample. This is a complex situation. Colorado law, as unfair as this may sound, provides that if the instrument indicates an insufficient sample, that evidence may be admitted as evidence of refusal at trial IF the District Attorney can prove through an expert that the failure to blow was for the purpose of refusing to complete the test. If that evidentiary “foundation” can be laid – the evidence of an insufficient sample can be admitted at trial. An instrument printout that reads “insufficient sample” means there was an inadequate quantity of breath to accurately and reliably measure the breath alcohol content. If the instrument itself so indicates, it is clear that regardless of the fact that various readings may have appeared on the display during the test, there was an insufficient amount to yield a reliable result. At the trial of a DUI in Colorado – if there was a refusal to take the test, evidence of the Defendant’s refusal to cooperate in testing, and the totality of circumstances surrounding that refusal, are admissible as evidence of guilt. There is no federal or state constitutional right to refuse to submit to a chemical test for blood alcohol content. Due process of law is not violated by admitting evidence of a Defendant’s refusal to take a chemical test when the Defendant was advised there would be adverse consequences of refusal. A DUI Defendants does not have the right to assert self-incrimination or a violation of their right to due process if the Defendant was advised that their refusal to take the test would lead to a revocation of their licenses. The Courts have held that a refusal to take the test is not “testimonial in nature” and therefore does not violate the privilege against self-incrimination. If a person refuses to take or to complete, or to cooperate with the completing of, any test or tests as provided in section 42-4-1301.1 and such person subsequently stands trial for DUI or DWAI, the refusal to take or to complete, or to cooperate with the completing of, any test or tests shall be admissible into evidence at the trial, and a person may not claim the privilege against self-incrimination with regard to admission of refusal to take or to complete, or to cooperate with the completing of, any test or tests. You are instructed that any person who drives any motor vehicle in the State of Colorado may be required to submit to a chemical test for the purpose of determining the alcoholic content of his or her [breath] [blood]. If a person refuses to submit to such chemical test, then the jury may consider such refusal along with all other competent evidence in determining the defendant’s guilt or innocence. If you find that the defendant refused to take a chemical test of the defendant’s blood or breath, you may consider this refusal along with other evidence in determining whether the defendant is guilty of the offense of Driving a Vehicle Under the Influence or Driving a Vehicle While Ability Impaired. The Trial Court may or may not need to amend this instruction by telling the jury that it is the driver’s external manifestations of unwillingness or outright refusal to take a chemical test for alcohol that are relevant in determining whether the driver refused to take a chemical test. What If I Decide To Just Remain Silent? – Doesn’t My Decision To Remain Silent Mean That My Silence Can’t Be Used Against Me At Trial Under The Fifth Amendment? So, a driver who responds “whichever” when asked his preference in testing is “deemed” to have refused a test and a driver who refuses to answer when asked whether he would prefer a breath or blood test is also “deemed” to have refused. To review: C.R.S. Section 42-4-1301.1(2)(a.5)(I)….provides that the accused has the right to receive the type of test he or she chooses unless the officer determines there are extraordinary circumstances that prevent the completion of the test elected by the accused within two hours. When the medical personell tasked with taking blood fail to show up – that works to the disadvantage of the Government’s case – not your case. The extraordinary circumstances exception also does not extend to situations where medical personnel refuse to perform the requested blood test and that this even if their refusal is outside law enforcement’s control. The prosecution must show that a “non-routine” circumstances prevented medical personnel from responding to law enforcement’s requests to fall under the exceptional circumstances rule. If the police advise a driver of their Miranda rights, including the right to consult with an attorney. and the the driver thereafter refuses to sign a consent form or otherwise refuses to take a test, and asks to speak with an attorney, that is NOT deemed a refusal. As a result a new rule emerged. If the police cause a driver to misunderstand the state of the law, the driver “cannot be held strictly accountable for his refusal” of testing. A recent Colorado case distinguished Calvert where the police officer said “okay” to a driver’s statement that he wanted to speak to an attorney before choosing any test. The Court found that the response of “ok” could simply have meant that the officer was acknowledging that the driver had made the statement and there was not other evidence to sho that the driver was, in fact, confused or misled. A driver’s assertion that he or she wants to speak with an attorney before deciding to take a test does not, standing alone, necessarily demonstrate the driver is confused or require affirmative action or clarification by police. Such a result would be inconsistent with the decisions holding that this conduct is generally deemed a refusal as a matter of law. If you are too injured or ill to consent to a test – the District Attorney can get your medical records C.R.S. Section 42-4-1301(8) provides that a person who is dead or unconscious may be tested without consent. § 42-4-1301.1(8). Any person who is dead or unconscious shall be tested to determine the alcohol or drug content of the person’s blood or any drug content within such person’s system as provided in this section. If a test cannot be administered to a person who is unconscious, hospitalized, or undergoing medical treatment because the test would endanger the person’s life or health, the law enforcement agency shall be allowed to test any blood, urine, or saliva that was obtained and not utilized by a health care provider and shall have access to that portion of the analysis and results of any tests administered by such provider that shows the alcohol or drug content of the person’s blood, urine, or saliva or any drug content within the person’s system. That subsection also provides that if a person is unable to give consent for a chemical test, or if a test is not conducted because the administration of that test would endanger the defendant’s life, the prosecution may nevertheless obtain access to any analysis or result of a test obtained by a health care provider. The statute essentially abrogates – removes – the physician patient privilege with respect to such analysis! This law may shock you. Because privileges such as doctor- patient are not constitutional rights (and are recognized as creatures of statute and not constitutional mandate), a state may constitutionally limit the application of that privilege. However, blood tests usually involve an additional type of cooperation and that is the requirement of the signing of a release form that releases the person drawing the blood from certain types of liability. A driver’s refusal to sign the hospital’s release form amounts to a refusal and justifies the revocation of the driver’s license under the law and it does not matter who “authored” the form used. The driver who selects a blood test must sign the form under C.R.S. § 42-4-1202(3)(a)(IV). A Defendant who chooses a blood test must sign consent and release forms, and a failure to do so may be deemed a refusal to cooperate. C.R.S. § 42-4-1301.1(3). Section 42-2-126(9)(b), C.R.S. governs the “judicial review” (the appeal) of the DMV’s driver’s license revocation orders. (4) Made a determination that is unsupported by the evidence in the record. The resolution of any evidentiary conflicts. When a law gives such massive deference to the Hearings Officer over factual matters…essentially placing them solely within the province of that Hearing Officer as the “trier of fact” – appealing their decision may make sense only when there is a mistake of law or procedure and not when the driver feels as if the Hearings Officer believed the “wrong person.” This decision should always be made with the assistance of a qualified and experienced Colorado appellate lawyer. H. Michael works hard to get his clients the best possible results in and out of the courtroom. 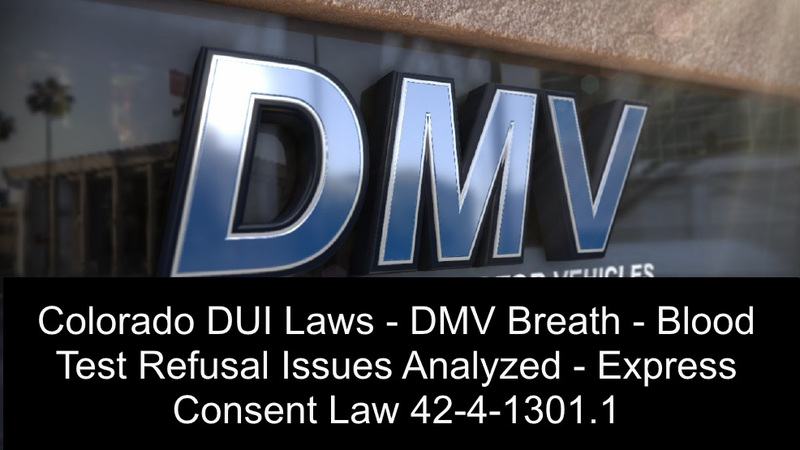 He has written, and continues to write, extensively on Colorado criminal law and he hopes this article helps you in some small way – Colorado DUI Laws – DMV Breath – Blood Test Refusal Issues Analyzed – Express Consent Law 42-4-1301.1.